The fish skeleton in this printable sign represents all seafood including fish, lobster, crab, eel, mussels and other shellfish. It lets people who are allergic know that no seafood was used when cooking the food or in the area where the dish was prepared. 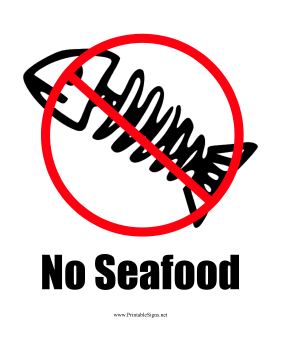 It should be displayed in schools, cafeterias, restaurants, and any other place people with seafood allergies congregate.